The Sargus is built Penn tough with a rugged corrosion-resistant aluminum alloy body, sideplate and rotor, as well as powerful features on the inside. They feature high-speed gearing for moving baits quickly and fighting fish with efficiency. Advanced features include five stainless steel ball bearings, infinite anti-reverse roller bearing, stainless steel main shaft, sealed drag knob, and a Techno-Balanced rotor for smooth retrieves. 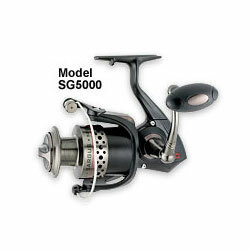 "I love this reel in the 3000 model for snook redfish and trout. Performs great and has good drag is long lasting too. What you want to do is put 12 pound mono under 150 yards of 15 pound fins braid. It can handle any snook as long as you fight em right. Good Luck and buy it"
"this reel backlashes a little but ive caught MONSTER tarpon with this reel"
"i had the sg4000 awesome reel great quality...i used it for snook fishing hook up to some nice sized fish and the drag was amazing....but sold it kind of regret it now because all i have now for snook fishing is the penn power graph"